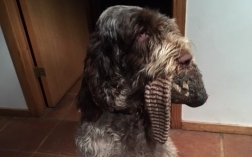 “After many years of being dragged round the Lake District hills with dogs on leads, we decided our young Spinone, Idie, would not follow in the same vein. On recommendation from a neighbour, we contacted Ingrid and enrolled on her obedience and sheep aversion courses. They may at first seem very prescriptive – but they work! The psychology behind the training explains things you were doing wrong and how to put them right. There is also support on the phone throughout training. After 2 weeks very intensive (you have to put life on hold) training, we have a dog which is a joy to walk, either on or off the lead, walking through sheep with confidence. Idie is also so much happier and confident. We couldn’t recommend Ingrid highly enough. Chris and Penny Plumpton and Idie.